NORTHRIDGE- Three Northridge students attended state tournaments for their respective sports over the past month. The students include: Riley Bunstine (‘20) for swim; and Klay Reeves(‘19) and Forest Belli (‘18) for wrestling. Belli finished out his final wrestling season by finishing runner-up at states in the 160 weight class out of 16 other wrestlers. The state tournament occurred March 8th through the 10th at the Schottenstein Center in downtown Columbus. Reeves also wrestled at the state tournaments in March. He wrestled in the 126 weight class and also finished 2nd out of 16 wrestlers. Northridge also was proud to send Buntine to states for swim at Denison University. Bunstine finished 24th in the 100 yard backstroke but was swimming with pneumonia during the meet. Northridge is proud of all the student-athletes that were able to make their way to state tournaments and hopes the best for them in future seasons or, in Belli’s case, college. ​NORTHRIDGE- We are now in full swing when it comes to our spring sports, despite snow hanging on to mid-April. That includes our track team, already in the midst of what is expected to be a promising season. With roughly 60 members on the track team, there are plenty of talented student athletes to fill the place of another athlete in the event of an emergency, such as illness or injury. That depth will be crucial as the season progresses. The team’s next meet was held at Newark Catholic on April 7th. The following schools attended: Johnstown, Utica, Lakewood, Licking Heights, and of course Newark Catholic as well as our own team. Of course, the majority of the track team participates in running events, with about a fourth of the team participating in field events that are offered. As of now there have been a few minor injuries. Track athletes say there are typically around 20 students that get some kind of injury during the track whole season. One of the most common injuries are shin splints due to all the impact on legs during practices and meets. There are a lot of aspects that go into getting ready for a track meet. There are typically two meets a week. Leading up to the meet there are hard days where they work more intensely and “easy days” according to Miller (18’) where they work on practicing relay handoffs, field events, blocks and just running in general to prepare for the days ahead. As far as goals pertaining the 2017-2018 track season, the most predominant one would happen to be wanting to beat Johnstown at every meet and to have more people make it to states, as well as performing well at the league meet. Although it is just one big team, track happens to be one of the more individual sports. Yes, there are relay events that need at least four people, but other than that everyone is working on competing for themselves on a personal level: setting goals, accomplishing those goals, and striving to be a better athlete. The baseball team has been off to a hot start to the new season as they are undefeated after the first five games of the year. The team still has a long season ahead of them, but they have high hopes of having a successful season this year. 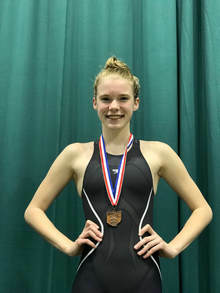 Riley Bunstine ('20), featured here at Districts, went on to swim at State. Courtesy photo.